Discussion in 'Amateur Radio News' started by KQ6XA, Oct 27, 2018. Hundreds of ham radio operators around the world have been active for the past several weeks, testing their radio techniques for interoperability. They're not competing in a contest or trying to win awards. 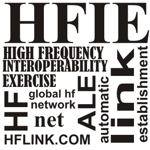 They have been participating in the High Frequency Interoperability Exercise 2018 (HFIE-2018), an operating event that takes place on the airwaves every few years, sponsored by HFLINK. 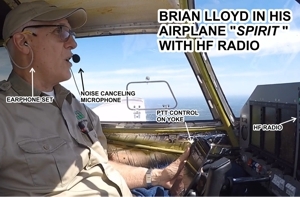 The ham operators are initiating contact by dialing up each other's call sign using selective calling (Selcall) and Automatic Link Establishment (ALE). They are making informal calls to engage in voice or texting communications on High Frequency (HF) in the international Amateur Radio Service frequency spectrum. 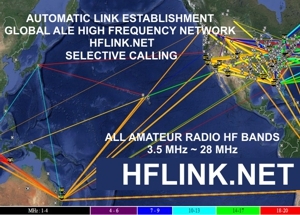 HFLINK.NET Selcall-ALE network all-band real-time map. Instead of dialing a telephone or using the internet, the direct calls are initiated on their HF radio transceivers, which are independent of land infrastructure or satellites. Simply dialing a call to a friend may seem like an ordinary task on a mobile phone, but it is surprisingly unusual on ham radios. Most HF ham operators are more accustomed to randomly calling "CQ" or gathering together in scheduled "skeds" and meeting group "nets" to share a frequency together. HF communications depend on bouncing signals off the ionosphere, which is prone to the variability of solar influence and the changing conditions of the earth's geomagnetic field. It has been particularly difficult with the solar cycle at its minimum this year. This variability has led to a wide variety of reliable operating techniques, procedures, and radio systems designed to benefit from the shortwave spectrum. HFLINK Coordinator, Bonnie Crystal KQ6XA, remarked, "We are seeing a lot of recent interest in selective calling. The statistics we gathered during HFIE-2018 show an increase of about 350 percent. There are now about 5000 registered ALE and Selcall callsigns globally in the net." Kurt KJ4AYT's solar-powered ALE-Selcall HF mobile 4WD. Photo: courtesy of Kurt Stephens KJ4AYT. Max Haselbach HB9ZEI in Switzerland, commented about the exercise, "I didn't know much about ALE at the beginning of this event. While operating and chatting on hflink.net , I met a lot of very helpful operators. I made links to Ced F4GFZ, and exchanged AMD texting and received calls from Thorsten DK1ESD. They guided me through on how to do it better." 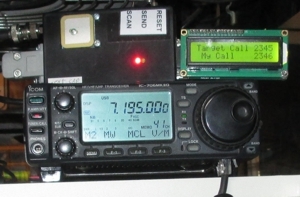 Codan 2110 manpack radio with Selcall and ALE in use. 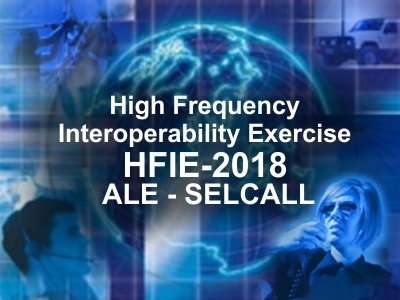 Selcall and ALE are slightly different formats that achieve a similar purpose: call up a specific ham operator or group of operators over the air using incidental tones. Both selcall and ALE are common in the radio equipment of HF commercial, governmental, or non-governmental organizations (NGO) ; but, amateur radio equipment manufacturers have traditionally been slow to advance their technology in the area of selective calling features. So, many of the operators working the HFIE-2018 event are utilizing commercial land mobile HF SSB radios with built-in ALE and Selcall, that have been adapted for ham radio service. Most are using computer-connected ham transceivers, running program apps such as PC-ALE, MARS-ALE, MULTIPSK, or HamRing. 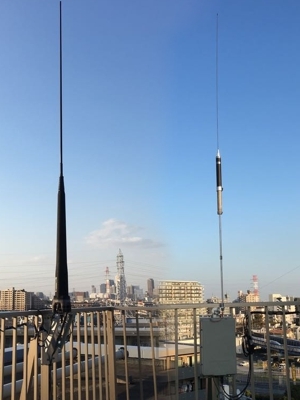 Tei JH1ESB's ALE-Selcall auto-tuned rooftop antenna farm above Yokohama, Japan, Icom AH-760 on left, Icom AT-140 auto-tuning a Super Antenna MP1C on right. ALE is a standard or optional feature in HF land mobile radios such as: Micom, Codan, Barrett, Icom IC-F8101, Harris, Rockwell-Collins, Rohde & Schwarz, and Kenwood TK90. 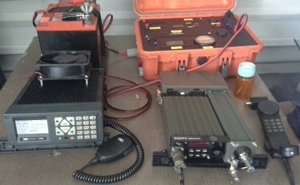 Tei JH1ESB's ALE-Selcall station with 2 Icom IC-F8101 radios, in a synchronized system. 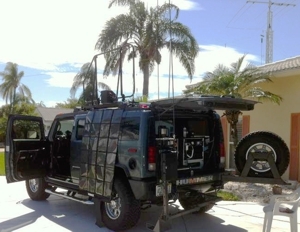 While any type of antenna system can be used for ALE and Selcall, the techniques of HF scanning and frequency agility often leads to a different approach from traditional amateur radio single-band or slowly-tuned antennas. Broadband antennas are the choice of many ALE operators, especially the T2FD broadband folded dipole or BBTD antenna, which can cover the whole HF spectrum without needing a tuner. Autotuners are very popular for mobile HF operation, as well as base stations. The objective for the system is to constantly scan receive channels at about 1 or 2 channels per second, and then be able to respond to a call on any given HF frequency within 2 or 3 seconds. The ubiquitous T2FD terminated broadband HF antenna. Hams have been using the HF Selcall standard, which is known as CCIR493-4 Selective Calling, for about 25 years. It consists of incidental tones in the audio range that can selectively call, trigger an alarm tone, or open the squelch. It was originally developed in the early 1970s by CCIR (Consultative Committee on International Radio), a forerunner group for ITU (International Telecommunication Union) advisory and technical standards. This selcall system became the basis of the Global Maritime Distress and Safety System (MDSS DSC) which is now widely utilized in ships and boats. The HFLINK information resource has supported it since 2003 as implemented in 4-digit (Open Selcall) and 6-digit (United Nations Selcall) format, and has published the open standards on the web. Tony KA2UFO's portable ALE-Selcall radio setup, Barrett on left, QMAC on right. CCIR493-4 Selcall is available in many different types of equipment suitable for ham radio use. Selcall is an embedded feature in HF land mobile radios such as: Codan (all models), Barrett (all models), QMAC HF-90, Vertex VX-1210, Icom IC-F series, and Micom Z. The SC2 selcall microphone by Jenal can be adapted to most ham radios to easily. The Naidia COOEE board by Richard VK5ZLR, is a plug-in unit that provides selcall for Icom ham radio transceivers. HamRing developer, Devin Butterfield K6DRS in California, commented, "HamRing is focused on an intuitive user interface and easy set-up. In a pinch, it even works with good old acoustic coupling, where you hold the mic up to the speaker. Many innovative features are planned beyond the normal selcall." 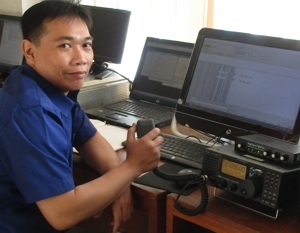 Varuliantor YD0OXH is Coordinator of a large group of active ALE stations for the HF Emcomm ALE net, which covers many islands of Indonesia. Ham operators have been utilizing ALE in the Amateur Radio Service for about 20 years, since the late 1990s. The ALE standard was developed in the early 1980s in USA as MIL-STD 188-141 / FED-1045, and is known internationally as 2G-ALE. 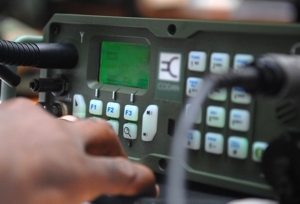 It grew out of an effort to improve interoperability of selective calling radio equipment made by various manufacturers. It became the de facto standard for adaptive HF radio systems, which keep track of HF propagation and available frequencies to improve the dependability and speed of calling stations. An active international net of ALE ham operators was formed in 2001 and has been in continuous 24/7/365 operation since 2007. 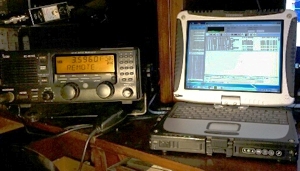 PC-ALE is a very popular computer program (Windows) among ham operators that provides a world-class ALE controller when combined with an amateur HF SSB transceiver. The scanning capability and a wide array of advanced features found in PC-ALE can basically turn a ham radio into an ALE radio system. PC-ALE is available for free and was created by Charles G4GUO, with new development and improvements by Steve N2CKH. The MARS-ALE program by Steve N2CKH, is also utilized by hams who are MARS members and operate ALE on the MARS systems. MULTIPSK by Patrick F6CTE is an advanced ham computer program that also provides excellent ALE calling operation and other functions. Brian Lloyd WB6RQN, flew the historic Amelia Earhart route around the world in 2017 with ALE HF in his plane. Later that same year, he led the Dominica Airlift Angels To Eden relief operation after hurricane Maria wiped out the island. The project lifted supplies and communications, including ALE radios, to Dominica. This year, Brian had some sage advice for some of the other operators in the HFIE exercise: "So, just having an HF station on-the-air, or even in a go-box, doesn't make you part of an effective communications solution... You also need to know how to get another station at the other end set up and interfaced with the people on the other end that need to communicate back to where you are. Only then do you become an effective component in a disaster and relief communications process." 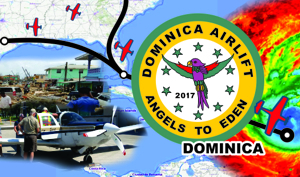 Brian WB6RQN with the Dominica Airlift Angels To Eden flights brought relief supplies and communication after hurricane Maria in 2017. The HFIE 2018 went from 12 to 22 October. For more information about upcoming events, please check the HFLINK websites and forums. 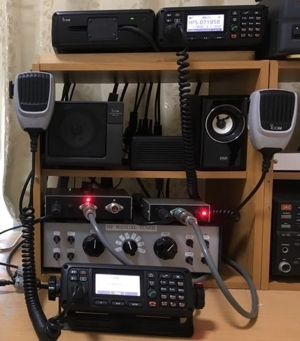 Amateur Radio Service operators in the event activated their stations on the air using the same standards as non-governmental (NGO) and government organizations worldwide for interoperable HF communications. The focus of operation during this exercise was ALE (Automatic Link Establishment) and SELCALL (HF Selective Calling). There are thousands of amateur radio operators worldwide with ALE-capable and SELCALL-capable stations. All are invited to discuss, learn, and ask questions using the HFN Comm Centre chat room on HFLINK.NET. The experience gained by operator participation in the exercises can also be useful for HF Emergency/ Disaster Relief communications (EMCOMM). N0TZU and K6DRS like this. for their work in providing real-time receiver reporting during HFIE-2018. JH1ESB and K6DRS like this. Talking about yourself in 3rd person? I counted about 30. Congratulations on your event. My question is, since 80%+ of the calls were to/from California, what is the plan if California is wiped out by an earthquake? Keep having fun, that's all that counts. I admire your "sticktoittiveness". Attention to detail is admirable too. for their work in providing real-time receiver reporting during HFIE-2018." Those were reporting stations, not active stations. The number of active stations during the event was in the hundreds, and they were spread across the the world. To clarify, while ALE is a neat technology and the HFLINK group is on its cutting edge, interoperability does not always require it. Last week there was a well publicized event on 60 meters that involved MARS stations interoperating with Hams simply using SSB. It started off with monitoring broadcasts from MARS HQ stations like call sign "Desert Eagle" (Fort Huachuca) giving more detailed instructions. After copying that broadcast, I QSY'ed to the designated frequency for my QTH, the southeastern USA, 5346.5 kHz. There I heard and made contact with MARS station AAR4LW, and exchanged the requested information on my county, zip code, and status of infrastructure (green). I was not the only caller. KY5U, K6DRS and KQ6XA like this. A lot of this sounds similar to the work being done with JS8call which allows individual stations to be selected or selcall'd, along with other features such as 'automatic relaying' of text messages through other stations running the same application. The nice thing about JS8call is it will work with "free text" messages at SNR's that are lower than other commonly used modes. Great for when bands are weak as they have been for the last couple of years. W0FW, K6DRS and KQ6XA like this. I enjoy niches of the amateur radio hobby/service. In my case, it's satellites. They are dependable. I know where they will be and when they will be there and I know the footprint they will cover. In the event of a major disaster i.e. an EMP event, I could use existing Keps to determine where the satellites are and would be able to communicate. With that said, I guess I just don't understand the need for SELCALL or ALE and it seems that it such a minuscule part of the hobby/service that its never going to mainstream like other niches. JS8Call is definitely cool. Glad to see some innovation in ham radio. Yes bands have been weak and finding good openings can be tough. One of the cool things about ALE is that it can frequently find band openings that even very skilled operators would not have expected. ALE and SELCALL are both robust modes and have been field proven for decades. They are also widely adopted standards which is critical for interoperability. I'm new to ALE and SELCALL, and actually just started getting into it during this op. I find it incredibly useful, and the options available with it are amazing! I personally consider it an indispensable tool in my tool box, and it's also just plain fun! I still have a lot to learn, and I know matter of fact that the people involved will help me every step of the way. Thank you to all that helped me get my setup going, and I am looking forward to being an active member of the group! KQ6XA and K6DRS like this. It also requires a sacrifice in signal strength as "broad-banded" antennas are sloppy radiators! IMHO, it is particularly an issue when ALE is used on mobile. Mobile is at a disadvantage to begin with as it loses a number of parameters not so important on a base station. Plus, it is moving thru a fluid., changing environment. Yeah, the "broad-banded" antenna compensates for those changes, but, again, at a loss in signal and message effectiveness. A mobile needs the most efficient antenna it can get to operate successfully. Until someone comes up with an effective, highly-efficient antenna for ALE, mobile will continue to fall flat on its face! To good effect. Especially WRT base stations. That's because the base station has height (antenna) and a more resonant antenna (usually). The mobile is down on the ground where everything changes as it moves along!